I am embracing the hashtag #nosolicitingincludesrealtors because I have the same problem! I love this article, I to have become irritated at all the door to door sales crap in our area as well. I wish idiots would learn that no means no and a sign on my door asking them not to push their good or services would be adhered to. 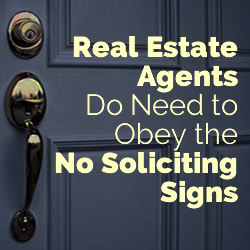 People can leave brochures and door hangers, as long as they don’t knock on your door. This is called canvassing, and it’s not the same thing as solicitation. Someone walking to your front door is not considered trespassing, either. So just be happy that people are out there trying to earn a living! If you don’t want their brochure, just throw it away. It’s not that big of a deal to throw a piece of paper away. Yawn. get a real job. Good for Lisa Dunn. Sounds like she is aggressive and works her rail off. I would most definitely want her as my agent. Well its a good thing she made you upset. I doubt she would enjoy working with you anyway. Any true entrepreneur can appreciate someone hustling. Nothing says classy like bashing another individual in your same field. Perhaps next time before blowing up and swinging for the hills a professional confrontation (i.e. pick up your phone) would be a better solution. The phone was picked up, and my requests to stop leaving fliers were ignored. Leaving trash on people’s porch for them to pick up and discard is not hustling or good salesmanship. It’s rude and annoying.